Where Is The Lift At Highbury And Islington Station? 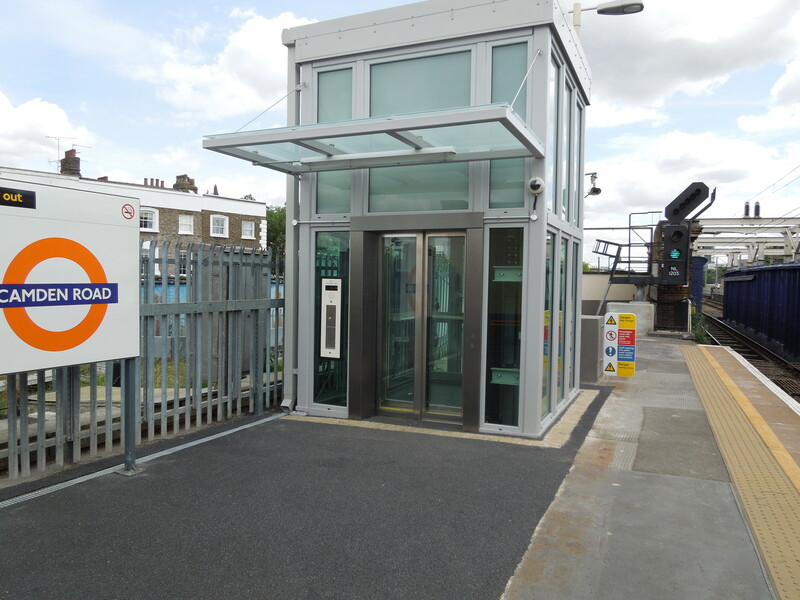 I have been impressed with some of the lifts put in at stations like Camden Road and Hackney Central recently. So I thought I’d have a look to see, if any stations, I use regularly were being updated with lifts or step-free access. Network Rail are managing the work across the rail network and the project is called Access for All. I looked at all the stations to be upgraded and found an entry for Highbury and Islington. Click this link and then go down a bit. The entry says that one lift is provided to the Great Northern and City line and that it was completed in Autumn 2010. I’ve used the station extensively for the last few years and I’ve never found this mythical lift. To check, I asked the station staff tonight, when I came through the station on my way home. They’d not seen it and were a bit worried if someone turned up in a wheelchair looking for access to the deep lines. As I said here, it is not the best station for step-free access, although that to the Overground is excellent. But the single lift mentioned on the Network Rail web site, would be a welcome addition. Today, I went up to the Angel to do some shopping. I don’t use a reusable bag, as I haven’t found one I like, since my old Waitrose one collapsed. So today, I was coming back with two plastic bags of shopping, of which one was particularly awkward as it contained a double large box of tissues. With only one good hand, getting on a normal bus is sometimes difficult, as the entrance is often crowded as people buy their tickets. But if I go to the rear platform or middle door of a New Bus for London, getting on is usually a much more straightforward affair. Especially, at the rear platform, where many use it as a quick way to get upstairs. As the bus has three Oyster card readers, if it is particularly busy, I will sometimes get in and then reach back to become a legal rider. Today, I saw a Hackney Central bus was arriving in a minute. So I waited! I struck lucky with a New Bus for London and I was able to ride home in First Class! I may be a non-driver these days, but it doesn’t mean, I don’t have visitors with cars. Last week, I bought some all day vouchers and today, I bought some for two hours. Would you believe that effectively you have two separate accounts for each voucher? The guy behind the desk in the Parking office thought it was crazy too! Surely systems should be devised to be the most convenient for everybody. I can’t imagine that this is convenient for anybody! Charles Everett Coop, who was Surgeon General by Ronald Reagan has just died. He seems to have really thought about his job and didn’t allow his religious beliefs get in the way of good health. But like our own Richard Doll,l who proved the link between smoking and cancer, he let the facts and the statistics do the talking. Interestingly, both were recipients of the Tyler Prize for Environmental Achievement. Both though have a health lesson for us all, as Doll died at 92 and Koop did even better dying at 96. So perhaps they not only looked at the facts and the statistics, but they acted upon them to prolong their own lives. I always like this quote from Richard Doll. Death in old age is inevitable, but death before old age is not. I would put one up from Charles Everett Koop, but I can’t find something pithy and direct. I don’t know much about Justin Bieber and his music, except that a lot of his fans are quite young. So to turn up last night two hours late as is reported here on the BBC, is inexcusable. Is The NHS The Cause Of Our Bad Health? Reports such as this one on the BBC web site, show that our health is getting worse. I have no complaints about the way, I’ve been treated in the last few years and the NHS was very good in their treating of my wife and son, and especially my granddaughter. But I do wonder if this good service is the problem and contributes to our bad health. How many smokers, drinkers and obese believe that the NHS will sort their problems out and of course at no cost to themselves or their families? If I had had a pound for every smoker, who said his father smoked all of his life and then he died at 90, I’d be a truly rich man. If we had to pay directly for our health care, we might take more care of our health. Not that I’m advocating it, but we should all perhaps get a statement each year from our GP about our health and how much we’ve cost the NHS. An aside here, is that for the last thirty years, I’ve had private health insurance, which I haven’t used much. Because the NHS is so good round here, with two world-class hospitals a short bus ride away, I have now discontinued it. If though say, I had a small inconvenient problem like a damaged finger that needed an operation, I would probably pay to jump the queue. But the cost would be well within what I saved on the insurance. This article from the Independent is a good summary of the state of the peer-to-peer lending market at the present time. This is the first couple of paragraphs. Many people were sceptical about peer-to-peer lending and questioned whether it would ever take off in the UK, but with savings rates from banks and building societies suddenly hitting rock bottom this new sector is becoming increasingly popular. With traditional savings rates having fallen by more than a third in the last six months, returns on offer from the peer-to-peer providers are looking even more attractive. Compared with mainstream banking, this new breed of finance is still in its formative years, with Zopa launching as the UK’s first peer-to-peer marketplace in 2005. But read it all, as there is some very useful information. I suppose savers’ biggest question, is would you lend your money in an industry, that is just eight years old? I’ve been on board Zopa, for around five years and can say it has been an enjoyable and profitable ride for myself.